“What’s in a name?” Why do you ask? 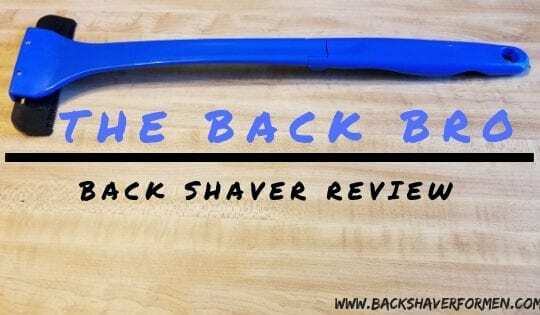 Well, the actual name of this shaver is hard for me to determine, as on Amazon it was called Do-It-Yourself Back Hair Shaver, Potou Back Shaver 20 Inch Extra Long Handled Safety Razor-Makes Grooming Easy, Quick and Effective. Quite a long name, but it doesn’t stop there, the instructions packet has the name of Easace. Left me scratching my head for a few moments. So, I suppose the name is quite a few different names. I am still a little confused about this but wanted to share this with you the reader in case you were also perplexed about this manner. This is something I need to address with this razor as well as some other razor currently on the market. 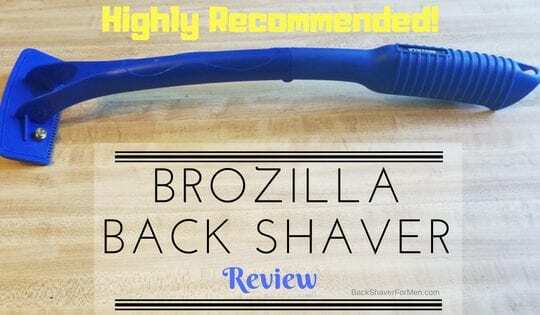 Like the OXA Back Hair Shaver, which I reviewed here, OXA Back Hair Shaver Review, this has the same head attachment but a different handle. It seems like some manufacturer is making these shaving heads but attaching different handles. That’s all right because thankfully these shaving heads work pretty darn well. I have also seen other on Amazon with the same head and handle but under a different name. But the Do-It-Yourself Back Hair Shaver seems to be the common name applied to this shaver made out of China. What Is Potou Back Shaver Razor? This Potou Do-It-Yourself Back Hair Shaver has an adjustable telescoping handle that allows you to quickly and easily set the length of this shaver to the length you want. The shaver head as mentioned above looks very familiar to me. 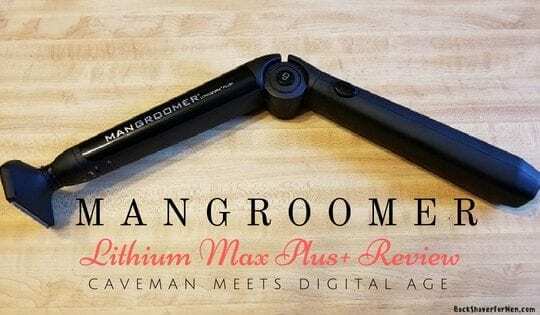 As I have already reviewed the shaver head, but the different handle is what is different and is worthy of doing a review on. Ohh and by the way, the shaver razor head works good, so I guess it makes sense to build a different model handle around a good shaver head design. 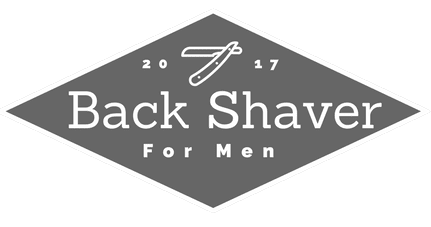 Manufacturing a single 4″ to 5″ inch long razor must be problematic, as many other back shavers on the market use laying three double-sided safety razors side by side to get the wide length. This method works extremely well, as many of my top ranked back shavers implore this manufacturing design. A note here is that the razor system is a closed system, as you cannot switch the blades out, you must purchase all new replacement heads when the blades become dull. This three-piece handle which can easily put together and broken down within seconds. The pieces are the shaving head, the head attachment, and the extendable handle. The shortest length setting on the handle setting is 14 1/8″ to a whopping 21 1/2 inches long. Plenty of length for the tallest of folks. The shaving head is five inches wide with a single line of blades. As this head by closer examination is made up of three standard safety razor blades, this is familiar setup for I have seen it on other back shavers and is a pretty effective system. There is also small plastic comb that before and after the razor’s business end to effectively channel the hair to be properly shaved. 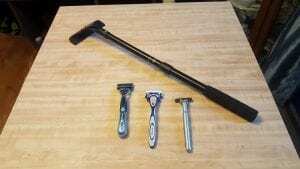 Size comparison to regular beard razors. How Does The Potou Perform? This is a solid back shaver. No, but it works quite well and in about 5 minutes I was done shaving my back. The business end of these razors are sharp and effectively shave one’s back quite easily. The back hair just seems to pop right off your back with each pass. Leaving a smile and a smooth back in its wake. The 4 1/2 inch razor cutting swath, could even make short work of a hairy giant back. This back shaver did leave me dripping a little back blood, but I just forgot about shaving around my few upraised moles and lopped them right off. Other than that, it didn’t cut me at all and makes a pretty safe shave. The long adjustable handle is another bright spot for this back shaver. 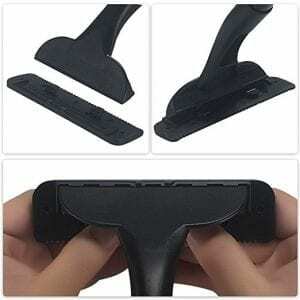 The foam padded handle is very comfortable and you are able to securely set the length quickly. There is a negative spot on the handle though…as it is straight and doesn’t lend itself to the most effective design. As a curved handle would better tackle the awkward task of shaving your back. It is by no means a deal breaker, as you can get your whole back with this shaver. It just takes a little more time and a little more effort to get the job done. I had zero problems indexing the razor to my back, by this I mean, I didn’t struggle to get the razor incorrect contact to the back skin. It just naturally just lined up well with little thought of the manner. I also loved how light this shaver was and the ability to choke up on it for more precision when shaving. Surprisingly, very lightweight in the hand. Shaving head gives a good decent close shave, while also minimizing cutting your back when shaving. The shaving head effectively locks into place with little chance of coming off when shaving. The shaver head is effective at removing back hair in quick fashion. Sharp razors!!! I really like the adjustable handle, as you can adjust the handle from short to long or anywhere in-between with a simple twist of the handle. You can effectively choke up on the handle with ease. Can be broken down into smaller pieces if traveling or storing with limited space. Shaver head doesn’t clog with hair when shaving, hair just falls like leaves in Autumn. Great length. 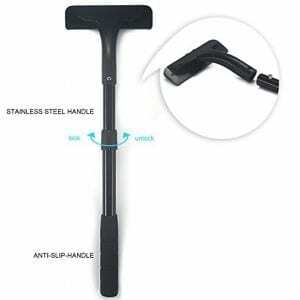 Extends to 20 1/4″ inches from blade to the bottom of the handle. Instructions are sent with this shaver, this is always a good thing and is always appreciated. A drawstring storage pouch is also sent with this and is a nice way to keep all the parts and instructions neatly together for traveling or storage. Just using the shaving head attachment with the shaving head can be used to shave other body parts. The metal parts seem to be made out of stainless steel. Fast and easy replacement of the razor’s head. A couple of snaps and done. The handle should have more of a curve to its handle as in some positions it was slightly difficult to hit every area of the back with ease, and with a more pronounced bend or curve to the handle, this would be better at reaching those spots. I eventually could shave all the areas, it just took a little more effort. Confusing Name/too long of a name/ multiple names. Yeah. Finding replacement blades isn’t the easiest thing to do, if you are looking for replacement razor head for this shaver, the OXA Do-It-Yourself Back Shaver Replacement Set will most definitely work. I know it is a different name but it is the same design. I have both back shavers and they work interchangeably. Would like to see a little stiff brush, to clean the razor after using it. This would help prolong the life of the razor. Buy some replacement blades right away to have on hand when your replacement razor heads go dull. Nothing worse than trying to shave with dull razor blades. A sharp blade is always a must. The OXA Do-It-Yourself Back Shaver Replacement Set will work with the Potou Back Shaver. 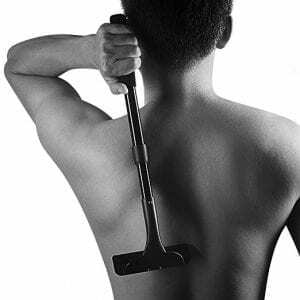 You should definitely check out my page Tips On Shaving Your Back. Packed full of pertinent information. Follow the directions provided for assembling and using the Potou for the first time. Always try to clean the unit after every use. Either with an old toothbrush or other stiff brush. I found this Potou Back Shaver to work quite well. 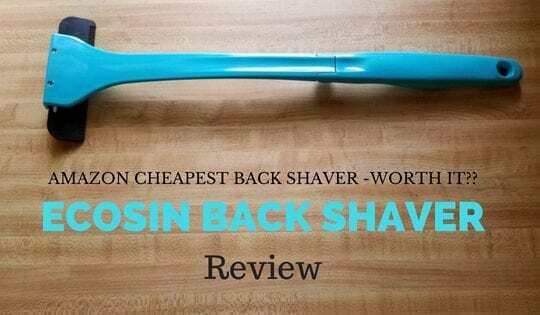 With a decent price and the ability to for the most part to shave your back easily, this falls in between good and great for shaving your back. The razors make quick work of back fur with few if any cuts. The whole shaver is lightweight and indexes nice. 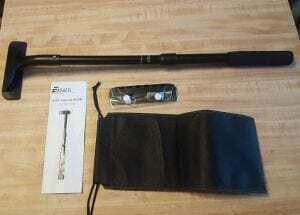 With the simple ability to adjust the length quickly, it will surely work for anyone. The wide blade also another great feature. 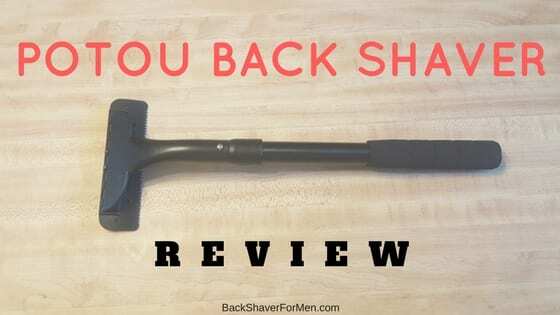 Is this back shaver the best I have reviewed? No…but it does the job with few negatives problems. The handle limiting design (too straight) to most efficiently shave your back is the only real negative about this shaver performance. So, if you’re looking at this back shaver as an option, the Potou Back Shaver will do the job quite nicely. Comfortable handle as well as adjustable. Great design. Straight handle is somewhat limiting in shaving. ← What Is Blade Buddy? Does It Work?